@nouveaubuzz #OscarBuzz See you at @RosebankMall! I have never seen all Oscar’s nominated movies in one year, but this year it is on my bucket list to do do. It will give watching the 87thAcademy Awards ceremony, hosted by Neil Patrick Harris, on Sunday, 22 February 2015 some extra glitter for me. Whoop! 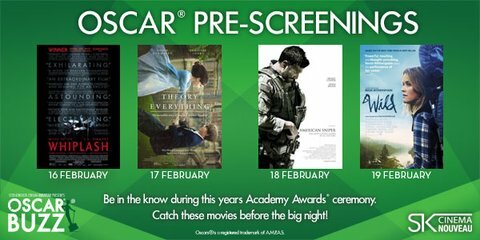 In an effort to ensure that movie buffs have the opportunity to watch and evaluate all these films on their Oscar chances before the big night, Cinema Nouveau is pre-releasing four of the Oscar-nominated titles next week, each film for one screening only, from 16 – 19 February 2015 . Wild on Thursday, 19 February 2015. They will all be screened at 20:00 each evening, at the four Cinema Nouveau complexes around the country – Rosebank Mall in Johannesburg, Brooklyn Mall in Pretoria, Gateway in Durban, and V&A Waterfront in Cape Town. As the countdown begins, Cinema Nouveau is inviting you to join in this year’s #OscarBuzz conversation. Watch any of the Oscar-nominated films in the Best Picture and other categories, post your short, sharp and pithy review on the Cinema Nouveau Facebook or Twitter pages, using the hashtag #OscarBuzz, and you could be in line to win some great weekly prizes: 35 in total over the seven-week period. The competition runs from this Friday, 16 January till 09 March 2015. Each week, the winning reviews will be block-mounted and displayed in the foyers of the four Cinema Nouveau complexes in Johannesburg (Rosebank Mall), Pretoria (Brooklyn Mall), Durban (Gateway) and Cape Town (V&A Waterfront). Cinema Nouveau Reviewer of 2015. The winner of this prestigious title will be selected by the Ster-Kinekor marketing team based on the best Oscar-nominated movie review posted on Facebook or Twitter using #OscarBuzz. The prize is a much sought after Ster-Kinekor Movie Premier Card that entitles the winner to watch films at any Cinema Nouveau or Ster-Kinekor cinema for free, for one year! The Cinema Nouveau Reviewer of 2015 will also be a special guest at pre-release screenings of select titles and premieres hosted by South Africa’s leading cinema chain. Over the next few weeks, Cinema Nouveau will release a number of the Oscar-nominated films. Eight films have been nominated for Best Picture, offering local movie-lovers a feast of the best of the best on the big screen at Cinema Nouveau and Ster-Kinekor cinemas. Follow #OscarBuzz with Cinema Nouveau on Facebook – Cinema Nouveau, or on Twitter @nouveaubuzz. For information and to make bookings, download the Ster-Kinekor App (on any Nokia, Samsung Android, iPhone and Blackberry smart phone) to download the latest updates and news, and to book tickets from your handset. Follow on Twitter@nouveaubuzz and on Facebook at Cinema Nouveau. For information and queries, call Ticketline on 0861 Movies (668 437). Next Article The 11th season of @IdolsSA might feature a drag queen @ShenayOBrien !